DIESEL is an ultra premium whey protein isolate engineered to be the most advanced protein formulation ever designed. 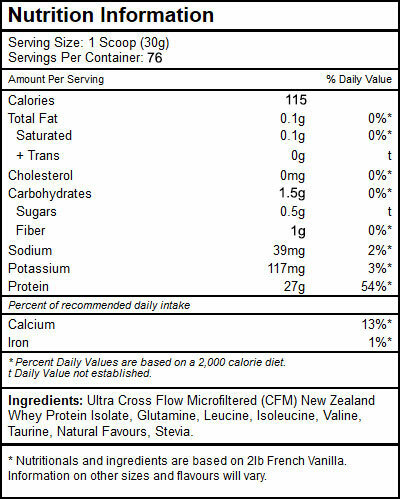 Derived from 100% New Zealand whey protein isolate, Diesel only uses whey from New Zealand cows that are “Meadow Fed (pesticide free)” and not given any antibiotics, rBGH or BST hormones. 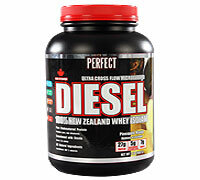 DIESEL's whey protein isolate is filtered using cross flow micro filtration (CFM) and ultra-filtration (UF). These proprietary membrane techniques are used to yield the highest levels of undenatured protein possible. The low temperature process also keeps the protein fractions (alpha lactalbumin, gylcomacropeptide, immunoglobulin, serum albumin, lactoferrin and lactoperoxidase) intact. But it doesn’t stop there! DIESEL's ultra potent muscle enhancing formula is mega dosed with 7 grams of Branched Chain Amino Acids (BCAA’s) and 5 grams of L-Glutamine, to help stop the breakdown effect of training and supply your muscles with what they need to rebuild, repair and grow. Ingredients: Ultra Cross Flow Microfiltered (CFM) New Zealand Whey Protein Isolate, Inulin (Chicory Root), L-Glutamine, L-Leucine, L-Isoleucine, L-Valine, Natural Flavours, Stevia. Recommended Use: Mix or shake 30g (1 scoop) of Diesel in 125 ml of your favourite beverage. Adjust amount of liquid to suit taste. Take 1 to 3 times daily or as recommended by a healthcare practitioner.